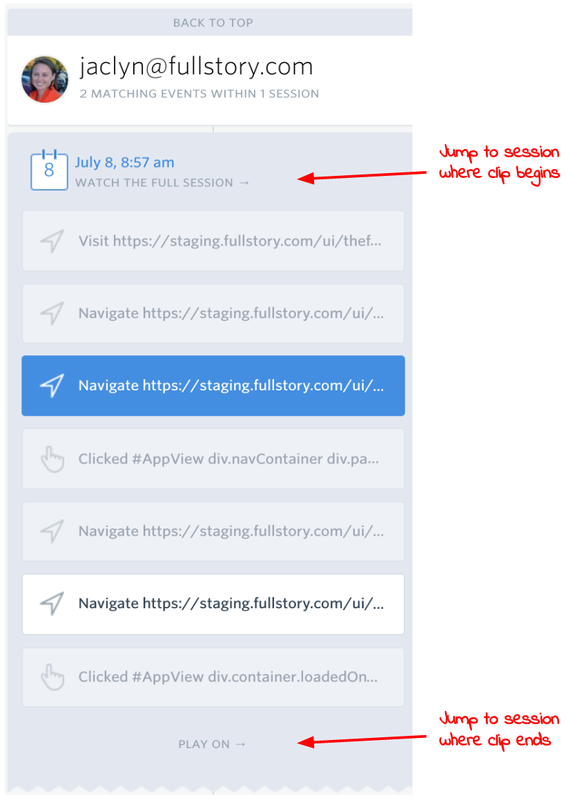 What are clips in FullStory? When you search for multiple events (e.g. clicked x AND visited page AND etc.) and those events occur in separate sessions, the results will display a clip rather than a single session.The clip will contains short vignettes of time surrounding the searched event where you'll see a few seconds before and a few seconds after each matching event. When you're watching a clip, you'll notice breaks in the session playback line. These breaks indicate a 'time warp' within the playback, wherein the playback is transitioning from a matching event in one session to the next matching event and session. Can I autoplay all sessions from a segment? Will anonymous users be recorded? Why do some sessions say "online" while others have a timestamp?